I’m going to let you in on a little secret. On the car ride home after an SCBBQ meal, Heather, Camden, and I usually record our thoughts using the Voice Memos app on my iPhone. That is where all the quotes in our reviews come from. This time, it was a little different. Heather actually was traveling on the way home from a trip to her mother’s house in Athens, GA, when she called and asked where along the way she should stop for BBQ. 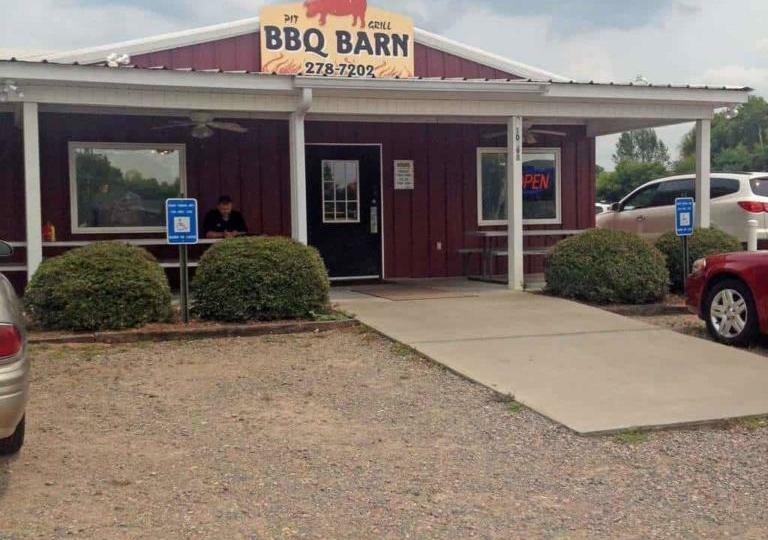 I took a quick look at our SC BBQ Trail Locator Map and decided the BBQ Barn in North Augusta made the most sense as it was the easiest to provide the directions for, though The Pot Smoker BBQ is also in that area. She picked up a half rack of ribs, a pound of BBQ, some banana pudding and a selection of sauces and headed home. When she arrived, we sampled and discussed the meal as usual. My recording is a long 23 minutes, so we must have gone in-depth. In fact, I remember sitting at the kitchen table sampling each sauce repeatedly and recording my thoughts on the nuances of each. Unfortunately, the recording will not play back, so this will be more general commentary than a detailed review. More upsetting is the fact that we sampled the product on July 1, 2015. I am just getting around to writing this commentary on July 27….and my memory is not the world’s best. So, these are only my clear recollections, nothing more. Apologies. The first thing I noticed when we put everything on the table was that the ribs didn’t look very enticing in their plastic container. The ribs had no sauce on them (which is not a problem), and looked like they had been cooked with a light application of a dry rub. The color was pale and frankly unappealing. To be fair, this was about three hours after they were purchased. I would imagine they look much better fresh from the pit, but the time had done the appearance no favors. The ribs lacked any depth of color and the seasoning imparted no additional flair. Cutting into the ribs revealed that they had not been overcooked and the meat clung well onto the bone. However, there did not appear to be much if any smoke ring in the meat (see photo below). This did not detract from our sample as the taste of smoke was apparent. I am generally not a fan of chopped BBQ, and this was no exception. I’m not sure why some places chop their BBQ; it is a mistake in my opinion. I have definitely come to favor pulled pork, but as long as the pork is good, then the issue is a minor one. Unfortunately, I cannot remember much about the BBQ other than that it was chopped, and I don’t want to comment on anything I cannot distinctly remember. What I can tell you is that we did not finish the BBQ that night. As for the sauces, there are many. BBQ Barn serves five different sauces according to their website. I am not sure that we got one of each; I could only discern 4 for sure. What I believe we got was the Georgia Red, the Hot Georgia Red, the Spicy Mustard, and the Carolina Gold. If we got the Sweet Smokey Red, I couldn’t tell for sure. What I can say for sure is that all of them were tasty, though pressed to pick a favorite, we favored the Georgia Red. I’d like to finish with dessert. I can’t say enough how impressed Heather was with the dessert case. The cakes and pies looked exceptional, and she really would go back just for the dessert selections alone. The coconut cake looked just like my grandmother’s, she said, and she found the apple pie to be very tempting. She went on and on about multi-layer cakes and fresh berry toppings. In conclusion, I encourage you to give the BBQ Barn a try and let us know what you think. I know we will visit again to update this commentary when life presents us with the opportunity.